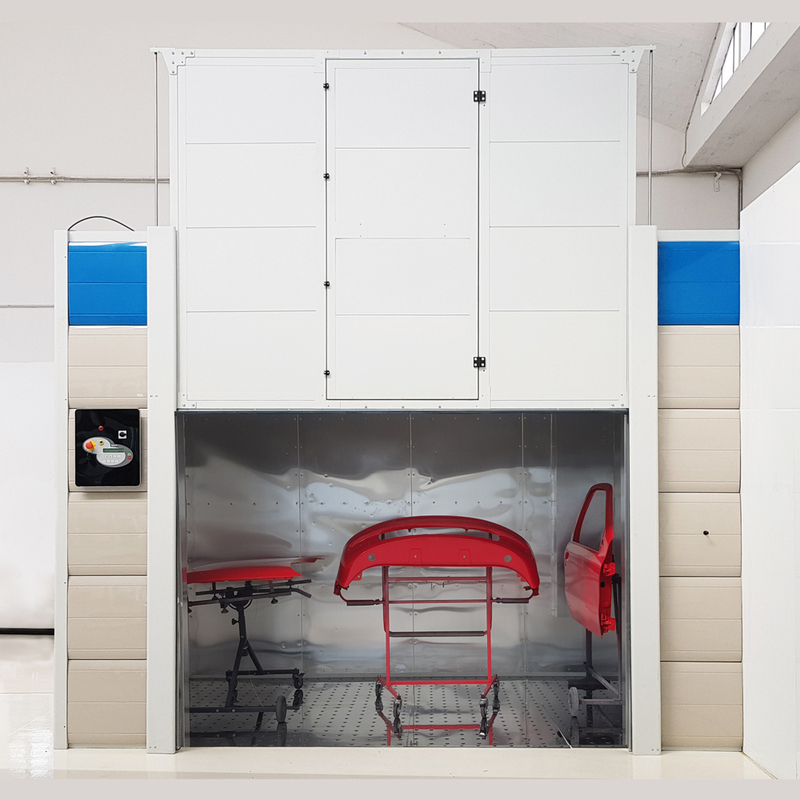 The DryBox is a small oven, 4 x 2 meters or 13.12 x 6.56 feet, and is the ideal solution for drying parts on stands. 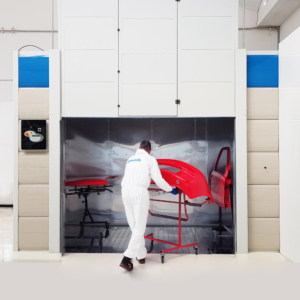 It uses Drytronic technology to dry paint and takes no more than 15 minutes to dry all loaded parts. 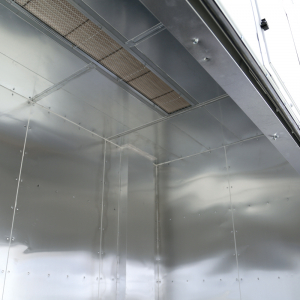 The walls and the floor inside the DryBox are made of a reflective metal sheeting that allows the radiant waves of the Drytronic panels (positioned in the ceiling) to reach all surface angles and dries perfectly in only 15 minutes. 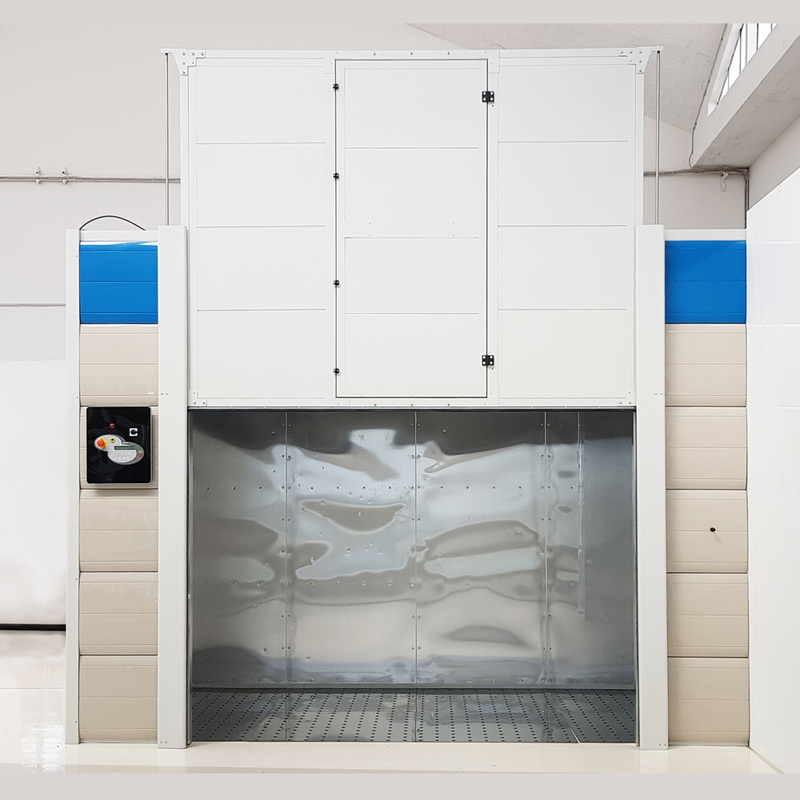 The computerized DryBox allows the technician to select one of the drying programs or set the time and temperature to dry the parts. The oven works automatically with regard to the drying parameters selected. 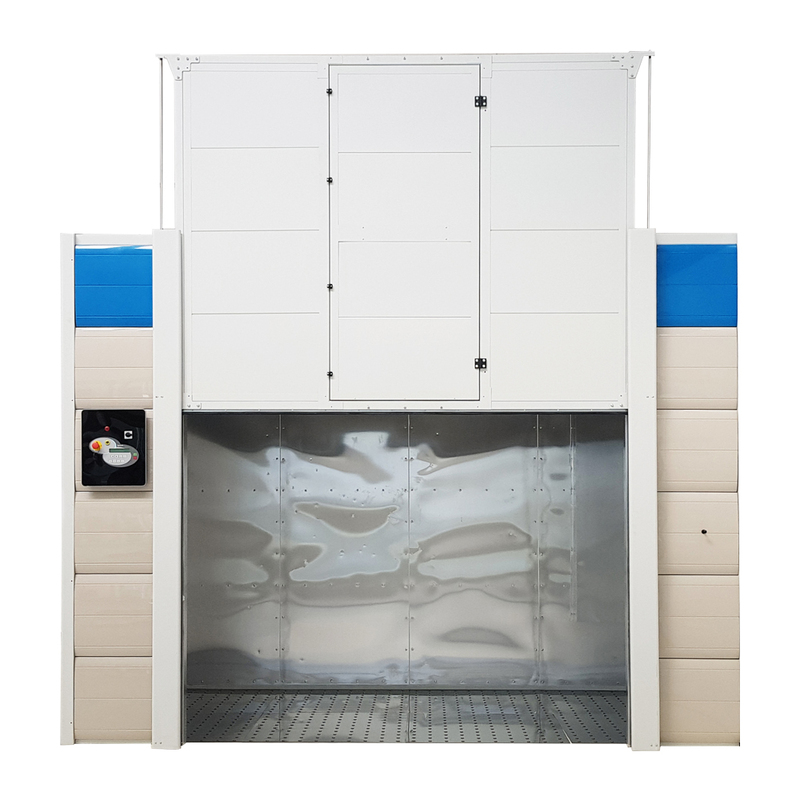 The DryBox has a front pneumatic door with an incorporated emergency door. This permits the painter to position the parts on stands fast, easy and efficiently. CoverTop (the outer covering) is made of ABS injected plastic molds that can be opened and closed allowing installation and/or repair of any electrical or air lines. CoverTop is available in eight different colors to coordinate with all other Symach products. Symach uses the DryBox in every FixLine layout. When there is only one SprayTron booth this allows the painter to maintain the production of 8-10 paint cycles when there are numerous parts on stands. The drying performance is of superior quality. It reaches 60 °C or 140 °F (measured at the part) in three minutes. In certain circumstances, it can reach 80 °C or 176 °F in five minutes. The Drytronic panels create radiant waves and the reflective metal interior creates a synergistic effect. This allows the temperature to rise inside the DryBox, creating a dual benefit of hot air and radiant waves. This reduces the drying time of clear coat to 15 minutes or eight minutes if using fast clear for miscellaneous parts. 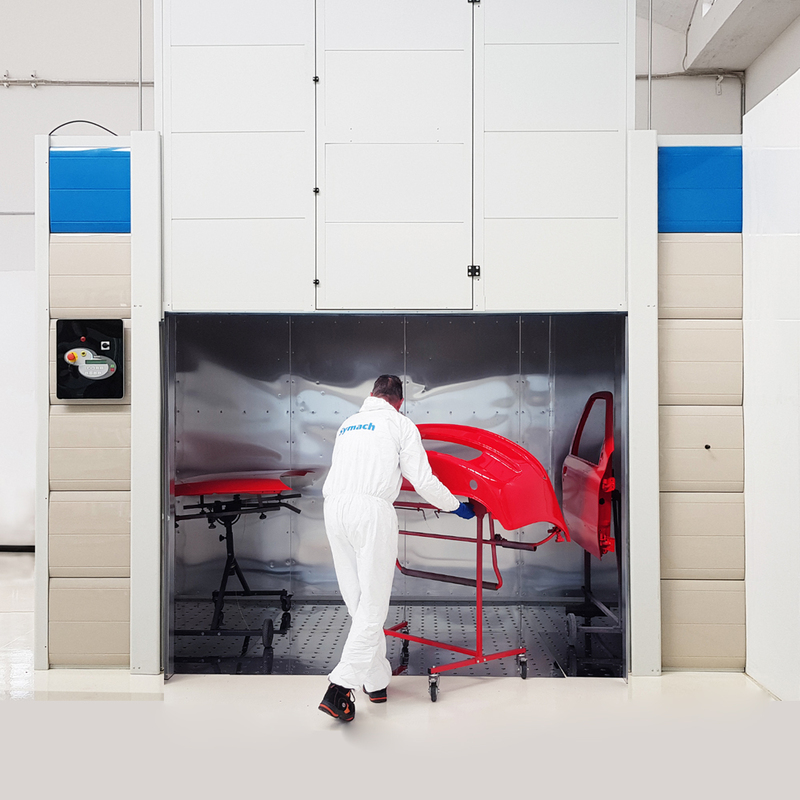 – the air fans are for inlet and outlet air ventilation to remove gas produced from the paint drying process. CoverTop (the outer covering) is made of ABS injection plastic molds that can be opened and closed, allowing installation and/or repair of any electrical or air lines. The DryBox has a front pneumatic door with an incorporated emergency door inside. The measurement of the door is 2 x 2,2 m or 6.56 x 7.21 ft. The DryBox’s multi-language computer automatically manages the different preset drying programs. It also allows the painter to set the time and temperature for the drying treatment. The DryBox side panel is a tubular-welded frame. On the inside of the cabin, there is reflective aluminum sheeting. There is 5 cm or 2” of insulation in the wall and on the exterior side there is CoverTop, an ABS plastic panel available in eight different colors. The ceiling is a tubular-welded frame to support the DryTronic radiant panels and the ventilation with an inlet air and filter. The floor is made of reflecting metal panels. The radiant waves and the hot air are produced by two DryTronic panels. There are two different air fans for inlet and outlet ventilation.